G.M. Collin is a leader in skin care. Produced in Quebec, this professional line delivers results like no other. Come in for a single or discuss a series with your esthetician for exceptional results in a short period of time. 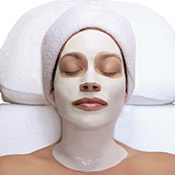 All facials include a hand or foot massage; and facials 90 mins and longer include a back and shoulder massage. A fully customizable clinical facial that revitalizes, moisturizes, and soothes. Particularly effective for reducing redness. A great “beginner” facial for every skin type and condition. Revolutionary treatment designed to revitalize fatigued skin. Oxygen inhibits the growth of bacteria while also increasing cellular energy, resulting in a brighter, more even skin tone. Great for all ages, and particularly effective on dull or acneic skin. A clinical treatment that includes four progressive steps working in synergy to cleanse, hydrate, and revitalize, and firm the skin. Perfect before a special event! A powerful antioxidant facial using Vitamin C for more even skin tone and brightness. This treatment is exceptional for both pre- and post-sun exposure; and it smells divine! With age, the cellular renewal process is delayed. Facial contours lose their definition and the skin appears to sag. Collagen 90-II improves the overall complexion by minimizing the appearance of fine lines and wrinkles. It restores moisture, leaving the skin well hydrated and radiant, delivering remarkable anti-aging results. Includes both hand and foot massage. G.M. Collin’s signature age-defying treatment combining five peptides including Matrixyl®, Myoxinol®, Argireline®, and Retinol.